A Scouser playing Tommy Cooper… of course. Why didn’t we think of that? Daniel Taylor revisits his most famous role as ‘The Tommy Cooper Show’ returns to Hanover Street. Nervous tics, raised eyebrows and Fez all present and correct. And the pathos. By Matthew Crist. In April 1984 the world lost one of its finest comedy talents when Tommy Cooper collapsed and died on stage at Her Majesty’s Theatre in London during a live televised variety show. Everyone thought it was part of the act at the time and, as Cooper slumped to the ground struggling for breath, he even drew applause and laughter from an audience he’d kept entertained right to the very end. 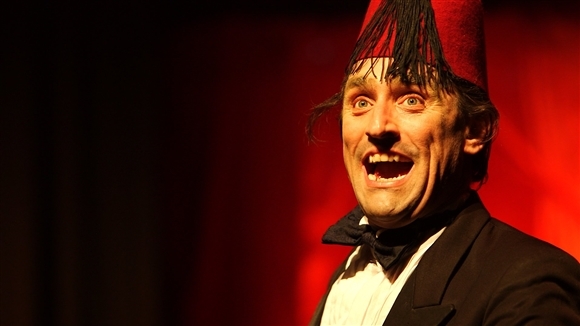 Thanks to ‘The Tommy Cooper Show’, which arrived at the Epstein Theatre this week for its latest run, the comic genius of this Fez-wearing funny man lives on – mostly due to the brilliance of a local lad whose portrayal of Cooper is as accurate as it is hilarious. The show is written and performed by Scouser Daniel Taylor, no stranger to re-enacting the lives of the great and the good, who just twelve months ago trod these very boards as John Lennon in the critically acclaimed ‘Lennon – Through a Glass Onion’ (read all about it). Despite the obvious gear change that comes with the different role, Taylor more than comfortably fills the size fourteens (!) of the comedy giant – just as he did the pumps of the ex-Beatle – as he lives and breathes the Welshman from start to finish with a brilliant representation. It was often said that people found Cooper funny even when he wasn’t trying to be, something which was sadly true during his untimely and very public demise, and as Taylor takes the stage (complete with trademark tassel and tuxedo), there are audible titters of laughter even before he has said anything… could there be a greater compliment? This isn’t purely a night of brilliantly accurate impersonations, though, nor is it just an excuse to relive some of the most famous and well known comedy sketches in the history of show business – this is the story of the man himself: what made him laugh, made him cry and made him the icon he remains to this day. The show is structured around the arc of Cooper’s career and is beautifully interwoven with some of his best-loved sketches, providing something of a storyboard of his life… both good and bad. And, yes, “spoon, jar, jar, spoon” makes an appearance. How could it not? Of course, with any form of comedy, there is often a darker side: a rough which inevitably has to accompany the smooth and ‘The Tommy Cooper Show’ is no different, choosing to never shy away from the demons that dogged the great man for much of his life without going overboard or dwelling on the negative too much. Fear of failure, a flirtation with alcoholism and even his extra marital activities are touched upon, yet they are never overbearing or detracting from the main thrust of the show, which is to celebrate the life and times of a true great of the entertainment world. The show also proves, by the way, that Cooper was very much an ordinary, if at times difficult, man who just happened to find himself living in a bizarre and parallel universe with all the temptations that brings. With a simple, yet effective, stage set (amounting to little more than a table of comedic props, an array of hats and a garden gate), the real theatre lay in the stunning performances of the cast members who work brilliantly together – every nuance, every beautifully-executed scene providing the ingredients for a truly enthralling evening. They say the true impact of a performance is best gauged by the reaction of those present and if the gathered throng – utterly engrossed for an hour, as if Cooper was gracing us with his presence once again – is anything to go by, Taylor has this crowd in the palm of his hand – rather like one of Cooper’s trademark sweaty handkerchiefs. Then, as the audience rose for the inevitable ovation, one last laugh and a final flick of the Fez later and he was gone.